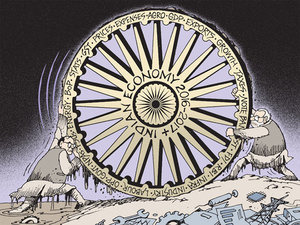 NEW DELHI: India is likely to be the world’s fastest-growing large economy in the next 10 years, driven by digitisation, favourable demographics, globalisation and reforms, predicts a Morgan Stanley report. According to the global financial services major, the trend line in India’s annual GDP growth has been accelerating to 6.9 per cent in 2000s, from 5.8 per cent in the 1990s, and this momentum is likely to continue in the next decade as well. Morgan Stanley expects digitisation will provide a boost of 50-75 bps to GDP growth and forecast that India will grow to a USD 6-trillion economy and achieve upper-middle income status by 2026-27.